We forecast that the accelerating growth phase of the past year will flatten out in the months ahead. A ramp-up in growth and investor risk appetite over the past year, courtesy of the dual “reflation” and “Trump” trades, helped lift earnings and share prices to records and volatility fell sharply. Our most recent read of the data suggests the acceleration phase may be over, and the forecast path of our WCA Fundamental Conditions Barometer (below) is expected to return to 50. At 50, we expect near-term recession risk to be near historically average levels. Where we go from here is unclear. While growth seems to be on a favorable tack, valuations seem to be discounting strong economic and earnings growth (analysts expect S&P 500 earnings to rise 10% this year and 12% next, according to FactSet, for example). Pushing against this rosy backdrop is some recent slippage in inflation and sluggish investment. If these trends continue, overly bullish expectations could be easily called into question. 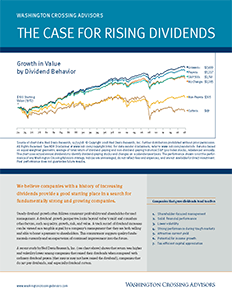 Today’s lofty expectations, evident in elevated market multiples and low volatility, make the risk-reward tradeoff less appealing from our vantage point. 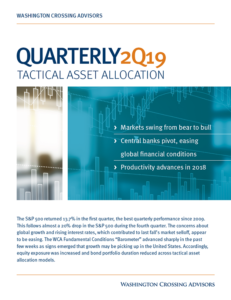 In keeping with our tactical discipline, we cut exposure to equities in the satellite portion of asset allocation portfolios from overweight to neutral last week. 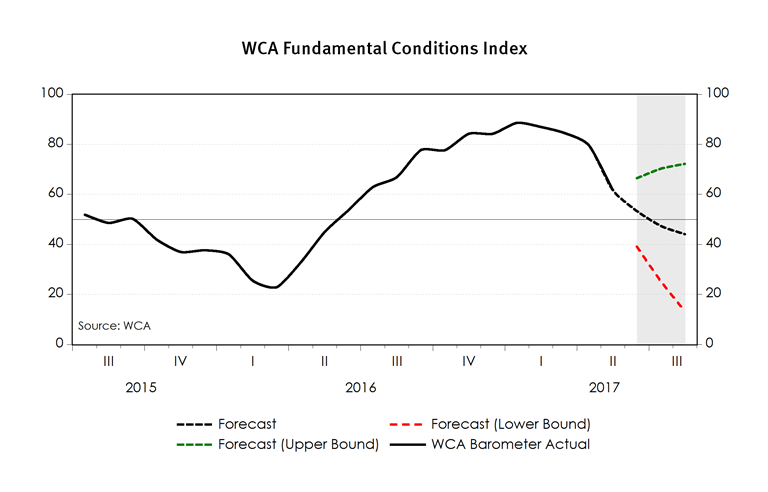 This move is supported by a downward revision to our near-term forecast path for the WCA Fundamental Conditions Barometer. This change marks the first “downshift” in equity allocation since late 2014.